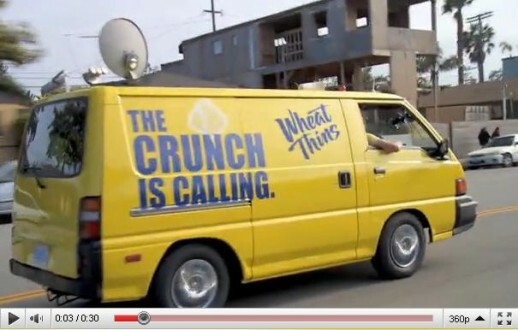 We came across a pretty rad example of a fun and engaging social media campaign from Kraft Foods to market their Wheat Thins product line. It’s a Twitter based campaign, which incorporates a YouTube channel with 250 subscribers and counting. The most recent video, a 30 second spot, has been viewed almost 200 thousand times! The campaign focuses on a mobile brand team, who respond in person (with tasty Wheat Thins of course) to the unsuspecting authors of real tweets about the brand, with the goal of encouraging more people to get involved and become a follower on Twitter. The first video, featuring a woman who tweeted about running out of Wheat Thins, shows the mobile team dropping by her home with a fully stocked pallet of the crackers being delivered on a forklift. Check it out! By now, just about every major brand has a presence on Facebook and Twitter, but this is the latest example of how these social media tools can be put to use for an even greater impact as I’m sure the brand will gain a lot of ‘friends and ‘followers’ as a result of this, not to mention the word of mouth it’s sure to generate. Anytime you can connect with your audience without necessarily trying to sell them something or blatantly hit them with your advertising, it’s a good thing. If your company hasn’t kept up with the explosion of social media tools, and the advantages they can create for your business, we here at Ninthlink recommend looking into it. Here’s a recent example of a YouTube channel we’ve put together for CPMG San Diego.